Clinical Psychology is for students studying clinical psychology as part of an undergraduate programme in psychology, nursing, sociology or social and behavioural sciences. 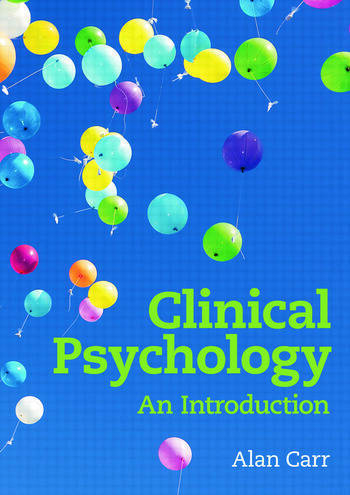 Undergraduate students who wish to know if postgraduate study in clinical psychology would be of interest to them will find this book particularly useful. the scientific evidence for the effectiveness of psychological interventions. There is a focus on both clinical case studies and relevant research, and the book includes summaries, revision questions, advice on further reading and a glossaryof key terms, all of which make it an excellent student-friendly introduction to an exceptionally interesting subject. What is Clinical Psychology? Childhood Behaviour Disorders. Eating Disorders. Drug Misuse. Anxiety. Depression. Schizophrenia. Personality Disorders. Models that Influence the Practice of Clinical Psychology. The Effectiveness of Psychological Therapies. Alan Carr is director of clinical psychology training at University College Dublin and has a clinical practice at the Clanwilliam Institute, Dublin. He has produced over 20 volumes and 200 papers and presentations in the areas of clinical psychology, family therapy and positive psychology. His books include the Handbook of Child and Adolescent Clinical Psychology, the Handbook of Adult Clinical Psychology, the Handbook of Intellectual Disability and Clinical Psychology Practice and What Works with Children, Adolescents and Adults? A Review of Research on the Effectiveness of Psychotherapy, and Positive Psychology. He has worked in the fields of clinical psychology and family therapy in the UK, Ireland and Canada.